Cambo USA recently contacted me with an opportunity to test the Cambo Actus technical camera with the FUJIFILM GFX—this was very exciting for me because I could renew my experience with view cameras in a new digital configuration! The folks at Cambo USA provided a fully configured demo unit, so I could put the system through its paces! The Cambo Actus is essentially a view camera front end to just about any digital camera that gives the serious photographer the ability to use full lens tilt & shift with back shift. 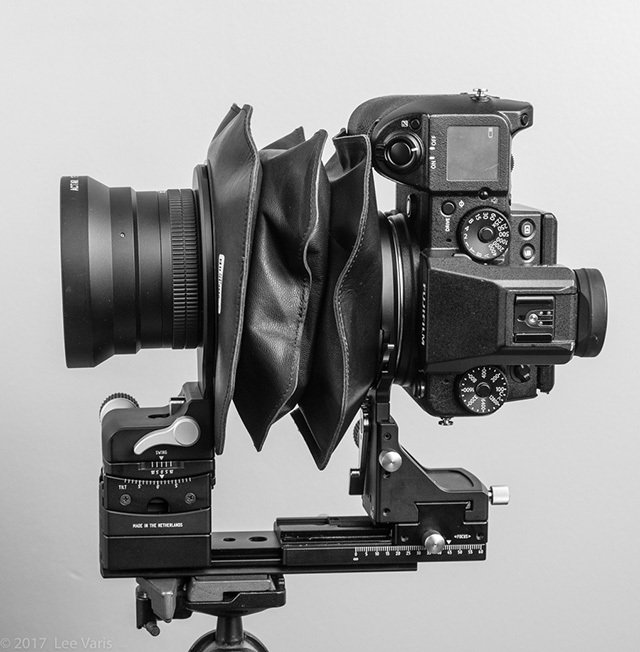 The Cambo Actus consists of a front lens board with tilt/shift on a rail system with a bag bellows that connects the front lens to the back board using a clever magnetic attachment. 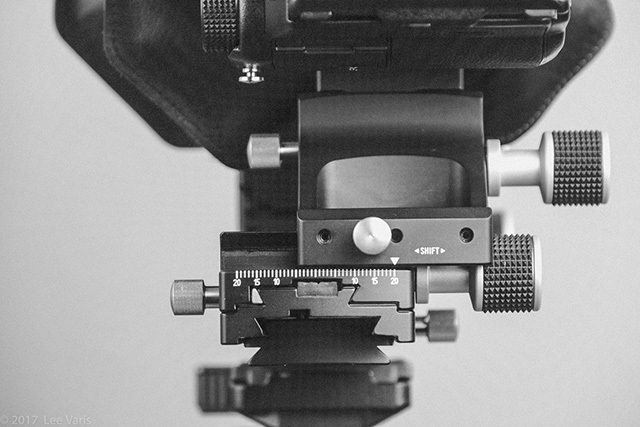 The Cambo Actus system uses large image circle view camera or enlarger lenses connected to a digital camera body through a bag bellows and a body adapter back standard. Basically replacing a view camera film holder with a digital camera body. I had the system set up for the amazing FUJIFILM GFX, a medium format 50 megapixel camera, and had an Actor 24mm & 90mm lens to test the full tilt/shift capabilities of the system. A carpenter’s bubble level can be used to make sure the back is parallel to the front of the building you are photographing. I was using the Actar 24mm with is fairly wide angle for the GFX medium format camera. Here you can see the perspective convergence in the building behind me. It was actually much more severe in the un shifted GFX shot—it makes the building look like its leaning backward! The shape of this building still looks a little strange, even though it is technically correct. 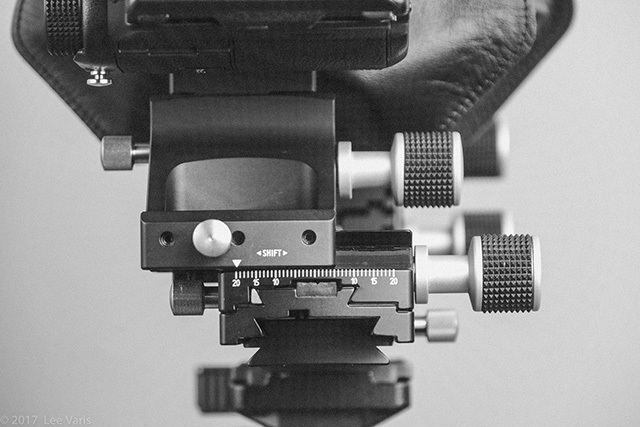 The shifting back of the Cambo Actus is also extremely helpful when stitching multiple shots together to get undistorted wide angle shots! I took advantage of the horizontal shift to capture a shot of the Ames Free Library in Easton Massachusetts when the best vantage point for the building was too close to show enough of the scene. Instead of panning the camera, I shifted the back left to right to get 3 shots of the scene. This sequence shows the extreme shift inside the image circle of the lens! I added a better sky into the merged scene in Photoshop, but the panorama merge was done in Lightroom. 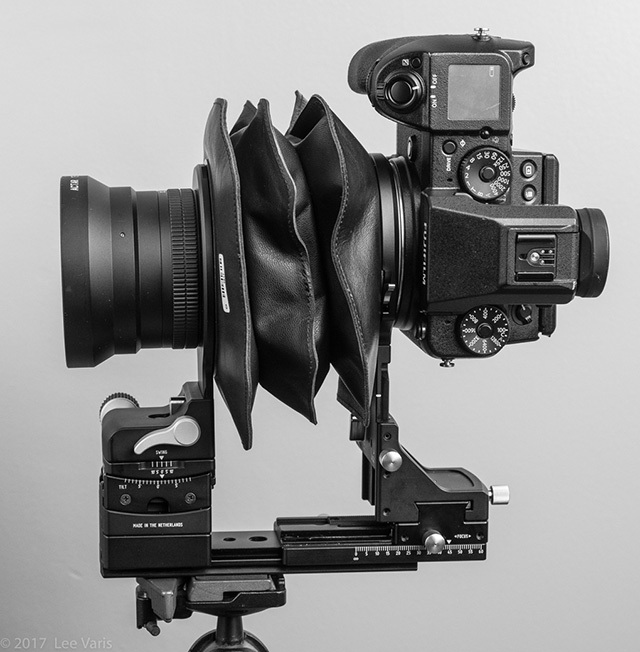 The Cambo Actus system is definitely the big boy way to shoot architecture, but the camera has many other applications that take advantage of a tilting lens! Stay tuned for part two of my exploration of the Cambo Actus GFX where I look at achieving infinite depth of field effects with a tilting lens! No the regular Actus GFX is fine – its just a nice thing for rear focus – I didn’t miss it and fine focusing the front only is, well… fine! Thank you for the interesting review and one of the only on the web about this combo. I’m doing architecture photography and I’m considering to buy the GFX. So I would be very interested in this combo : how does the 24 Actar behave compared to a much a more expensive Rodenstock lens? How much shift can you use compared to a canon 17 or 24 TSE? Excellent, because I’m mainly going to use the Actus GFX system for Landscapes and was stuck on purchasing the perfect system! Thanks for the hands-on insight, Lee! !